Acidity. That’s a pretty caustic word. It conjures up visions of car batteries gone bad or way too much vinegar on the chips. And it’s a word I avoid (like, well, battery acid) when I talk about wine simply because of the negative pictures it brings to mind. 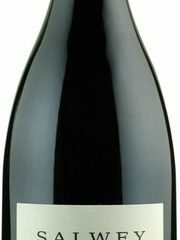 So why am I here then, happily sipping on a 2006 Quails’ Gate Pinot Noir ($24.99/13.7% ABV), a wine made from estate-grown Pinot Noir grapes, admiring its absolutely gorgeous acidity? Well, the truth is, acidity in wine really can be a good thing. We almost always expect a certain level of acidity in our white wines, especially those grown in cooler climates. Riesling, Sauvignon Blanc and Pinot Grigio all deliver a welcome succulent tang. But it’s important in our reds, too. Acidity gives all wine its juiciness, its thirst-quenching and mouth-watering qualities, its spirit and its liveliness. It also contributes to a wine’s ability to age gracefully. Acidity can make your wine—white or red—a playful and enchanting sprite, lovable cheeky monkey or beautiful woman who is elegant and sophisticated yet approachable. Without decent acidity, your wine is boring. It’s flabby and flat, with no life, no verve. Many great food-friendly red wines besides Pinot Noir have high acidity: Chianti (sangiovese), Barbera, Syrah. And while Pinot Noir and Sangiovese are often regarded as lighter bodied wines, it’s not their “weight” that defines their acid levels. Red wines considered high in acid are typically made from grapes grown in cooler climates. An Australian Shiraz (warm climate) will not naturally have the same level of acidity as a Syrah from the northern Rhône (cool climate). That being said, you don’t want just acidity in your wine; rather, what you want is a balance. And with what do you want to balance your wine’s acidity? With its fruit and tannins, of course. It’s this balance that makes a young wine drinkable and a fine wine ageworthy. 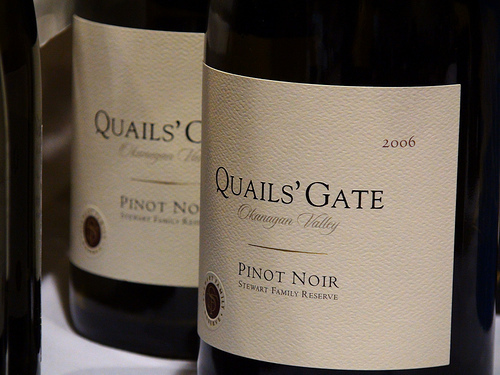 This Quails’ Gate Pinot Noir is chock full of cherries, spice, smoke and leaves from the forest on the nose. On the palate I find black cherries, red berries and spice. It’s certainly not one of those big, jammy “black-fruit bombs” made so popular by our Australian friends. And it’s not a tannic leviathan like a California Cabernet Sauvignon that cries out for a slab of rare beef. No, this wine’s fruit is beautifully balanced to its acidity. And its tannins, silky and supple, give the wine just enough texture, without threatening to punch you in the kisser to make you pucker up. Balance again. And then we have the alcohol content. Pour yourself a glass of this wine, give it a good swirl, and then take a look. What you see forming on the side of the glass are the “legs” (sometimes they’re called “tears”), which do not (contrary to what many people will tell you) indicate the quality of the wine. The “legs” are due to the Marangoni effect, movement along a surface due to different surface tensions in liquieds, in this case alcohol and water. If this wine were to have a 15% instead of 13.7% ABV content and the resulting stronger “legs,” then my guess is you’d not enjoy it be cause the alcohol would simply over power the fruit, acidity and tannins. You’d not have balance. All the better to balance out our home-made turkey soup. Yummy! If you don’t have a pot of soup on the boil, keep in mind that this wine will work equally well with a winter-time stew, grillesd salmon or ham sandwich. Kathleen Rake is one lucky oenophile. She’s managed to marry her decades-long love affair with all things vinic to her craft—writing. Read her other ramblings at http://BetweenTheVines.ca.